This is the first installment of my new blog project! I'm going to be interviewing local doggy business owners so that we can spread the love and knowledge to all the pups of Halifax (and beyond). First on the blog is Raina Kirkland. She owns Colossus Canine and her Great Dane, Piper, has also been a model for Wet Nose Images! Q: hi raina! How did you decide to start this business, and why is it important to Haligonians? As a Giant Breed owner myself, I felt very frustrated always coming up empty handed after searching the top shelves and dusty bins in pet stores to find even the simplest items - like a 26" collar, or a food bowl large enough to hold a growing 100lb puppy's meal. I started Colossus Canine in response to the lack of options, from both local retailers and online stores that Giant Breed Dogs had for products that were designed with their size in mind. I think starting my own business is important to Haligonians to show that even in an economic downturn, and in a province that generally has a lack of employment, we can all succeed if we put our best efforts and creativity to work. Q: What exactly is a giant breed? There is no exact science to identify a "Giant Breed". Some say any dog over 100lb, while others determine the label should be affixed to specific Breeds. 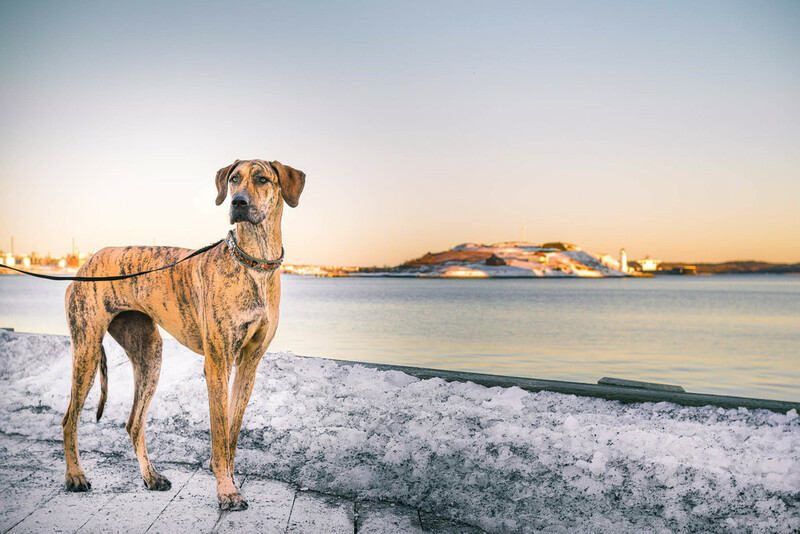 The typical Breeds that come to mind are the Irish Wolfhound, Great Dane, Newfoundland, and Saint Bernard. But there are many, many more Breeds that fit the category. I say, any dog that is too big to fit the standard sizes found in most pet stores could be considered as a Giant when it comes shopping with Colossus Canine. Q: What types of products do you offer for giant breeds? We're always searching for more, but thus far we offer an assortment of durable nylon and leather dog collars and leashes, an incredible harness, dog coats suited for all seasons of weather, protective dog boots and paw creams, collapsible traveling bowls and a waterproof car seat protector, first aid kits, ID tag clips, and an orthopedic foam bed. We're also working on adding a "Couture Collection" that will partner up with other entrepreneurs globally to provide our clients with made-to-order custom products. Q: What are some of your most popular items? The Freedom No-Pull Harness is very popular and extremely effective for giving control to the walker of dogs that like to pull on the leash. The 34" Satin Lined Collars are also some of our best sellers as you can't find many collars that will fit that large of a neck. During the colder months, the Chilly Dog Coats are most sought after to keep the shorter furred Breeds warm and dry on their Winter walks. The Orthopedic Foam Bed is also one of the biggest and most supportive beds on the market. Q: I noticed on your website that you mention re-using cardboard boxes and stuffing for your orders. Is recycling and being environmentally friendly an important goal for Colossus Canine? A goal yes. We make as many choices as we can to keep our environmental footprint low. Many online consumers appreciate the complete package experience with branded boxes, custom filler and individually boxed items, but we choose to focus on keeping our costs to the consumer low and letting the quality of our products speak for the store instead. Q: Tell me about your own giant pup, Piper! Piper is a handful! She's the hyper version of the Great Dane that you never really hear about. Yes, she is a couch potato and a sweet gentle soul, but her energy is never ending and she loves to express it in leaping kangaroo-style hops. She is our second Great Dane and was re-homed to us at 8 months old. Her confidence had been squashed with the move and it took us a great deal of positive reinforcement and conditioning to get her back to a the trusting, happy girl that she is today. Q: Where can the pups of Halifax find and follow you online? The direct store address is www.ColossusCanine.com and we are also on Facebook, Twitter, Instagram, Pinterest and Youtube. Q: What is your favourite local dog-related company? Definitely Planet Paws! It's an incredible place to go and learn about pet nutrition and health. I always walk out of there learning something new that I can incorporate into both Piper's diet and my own. Thank you so much for taking some time out of your day to talk about Colossus Canine, Raina! Is there anything else you'd like to add or talk about? I'd just like to say Thank You Cassie for allowing us to join in on your conversations, and for servicing the pet world with your incredible talent. Who would you like to see interviewed in a future blog post? I've got some great businesses lined up already, but keep the ideas coming!